I made my first quiche on Sunday! Not only was it remarkably easy to make, but it got rave reviews from our company. I first perused my cookbook collection, but was disappointed that the recipes called for large amounts of cream or milk. Since I have an intolerance to milk, I try to limit the amount that I use when cooking. Convinced that I could find a tasty recipe that had far less milk, I hit up allrecipes.com. I settled on a heavily modified version of Easy Broccoli Quiche. While reviewers loved the general idea of the recipe, most said that the mix was too wet. My changes are detailed in the recipe below. As a time-saver, I used a refrigerated Pillsbury pie crust and frozen baby broccoli florets. If you’re looking to save even more time, frozen chopped onion could be used in a pinch. I will likely add another egg next time, as the egg mixture didn’t rise to completely fill the crust. Aside from that minor criticism, I have no complaints. The egg mixture baked up nicely and was quite flavorful. I took this photo right before everyone went back for seconds – there were no leftovers! 2. If using frozen broccoli, thaw before chopping. 3. Melt butter in large saute pan over medium-low heat. 4. Add onions, garlic and broccoli. Cook slowly, stirring occasionally until the vegetables are soft. 5. Whisk together beaten eggs and milk. Season with salt and pepper. Stir in vegetable mixture and cheese. 6. Place unbaked pie crust in pie pan. 7. Pour egg mixture into crust, and bake in preheated oven for 30 minutes, or until center has set. I have tried to make Quiche before and failed miserably. After watching chefs on Top Chef get sent home for making bad quiche I decided, maybe Quiche is not that easy to make. Your recipe looks very easy and delicious. I am going to try it tonight. I will let you know how it goes. Grace – I hope you like it! Since I use a small amount of milk instead of large amounts of cream, it isn’t the creamiest quiche, but it’s flavorful. Looking forward to hearing how things turned out. I made the quiche last night. Yummy, Yummy, Yum! I followed your recipe but added some mushrooms as well. The good thing is that my kids loved it too. I’m glad you enjoyed your quiche! Mushrooms sound like and excellent addition – I’ll have to try that. This recipe reminds me of a zucchini quiche that I’ve made many times in the past, as it is one of the rare meals that everyone in the family enjoys. It is also a nice alternative for those who have an aversion to broccoli. If you’re interested, I’d be happy to share it with you. 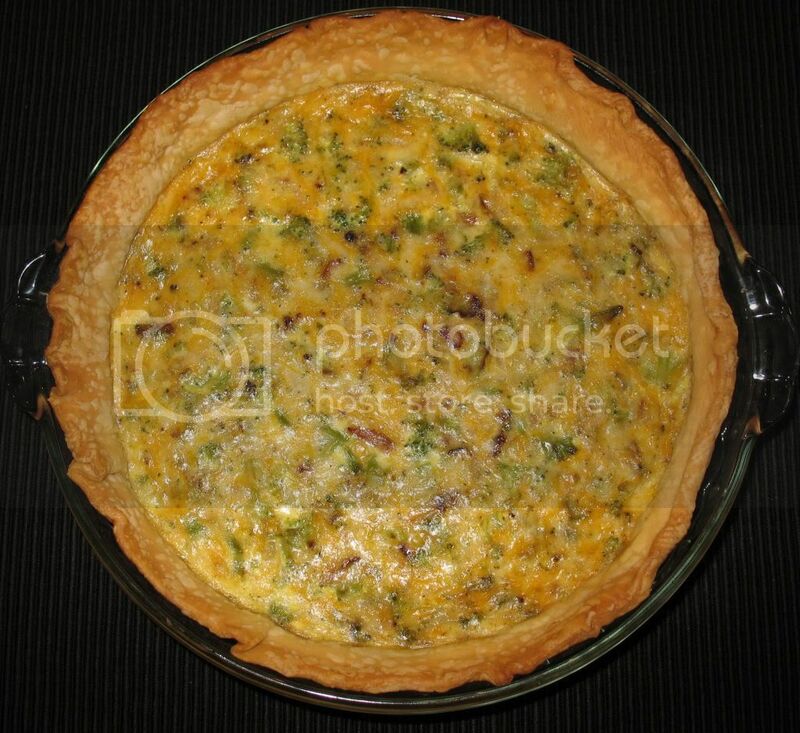 Donna – The zucchini quiche sounds delicious… I would love the recipe! Please feel free to post it here in the comments section or e-mail me at domesticpursits[at]gmail.com. I just whipped this up in about 15 minutes. Super quick and easy. I added a little dried mustard powder, garlic powder, and onion powder and omitted the minced garlic. It was delicious and as an added bonus, both my one year old and 3 year old ate it! That sounds great! If you’re interested, I have an updated crustless quiche here - it has a little more milk and eggs.